Don’t you find that some days just have a theme? I’m going to call today’s theme Baring All. Obviously I should stop my four year old being quite so obsessed about “bonding” with nature so that his brother won’t copy him. I then had an energy auditor at my house looking at the electricity use in my house. My joke to put a picture of myself in a bikini on my husband’s desktop background didn’t seem quite as funny when standing around with the auditor, discussing the screen’s energy use. Again awkward!! How do you deal with these kind of days? I just laugh them off but the part of today that I need to change is to stop scheduling things back to back. It’s so hard to fit everything in at the moment. I’m drafting and re-drafting the book in it’s design stage, looking after my gorgeous children, getting back to during the week exercise because Leo is happy to go to the creche and then every time Leo is supposed to be having a nap I’ve either booked something in so I don’t get to rest or I push out Leo’s sleep so much I can’t get him to go down. How, as busy Mum’s, do we avoid doing this to ourselves? I am usually pretty good at getting a meditation in, some reading time, some quiet but it’s been impossible because of the things I want to get done. 1. Schedule in the quiet time. Make it important. 2. Realise that the extra energy you use now to keep going you are going to have to pay back (ie you are going to burn out or crash). 3. Leave what you can. Yes you may need to do three more loads of washing and clean up the kitchen but you don’t have to do it right now. Right now is for you. 4. Know that even just fifteen minutes to yourself can replenish your energy. Sit down! 5. Get rid of the clutter. If there are less things in the house to put away then there is less mess and more time for you. Plus it’s an excellent activity for letting the Universe know you are ready to let new things into your life. What was the theme of your day today? I’ve started putting some deadlines in place for myself – walk done in the morning. Computer off by 8pm, in bed by 10pm! I am mostly achieving! That’s awesome. You think you can wing it until you feel totally frazzled!!! One word Nic…outsource! Write a list of all the stuff that needs to happen, but you don’t want to do and pay, beg, bribe someone else to do it! 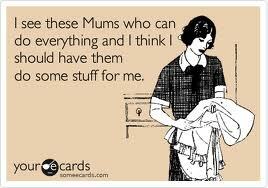 Works especially well with cleaning, ironing and some degree of food prep!